I LOVE to read your books. Since we don’t have much money, my mom said that I had to get them from the library. But, the library did not have all of them there. My school library had more, but they did not have Tales From a Not-So-Happy Birthday, plus my mom and dad do not like to spend money. What should I do?!?! Okay, well first of all, I’m SUPER glad you’re excited about Tales From a Not-So-Happy Birthday! But it doesn’t release until October 16th, so that’s why you wouldn’t be able to find it in libraries or bookstores. But as for the other books, I wanted to answer your question, because there are a couple COOL TRICKS about using a library that it seems like a lot of people don’t know. And I want ALLLL my fellow book-lovers to know, because everyone should have access to the books they want to read, no matter how much money they have!!! So first, just because you don’t find a book on the shelf at your public library doesn’t mean they don’t have it! There’s a good chance it means someone else has checked it out. But that’s when you do this thing called PLACING A HOLD. It’s so cool. You can place a hold in person and, depending on the library, online. But either way, you can ask a librarian to show you how the first time. When you place a hold, it’s like saving a spot in line. So if no one has placed a hold in front of you, your hold means that when the book gets returned to the library, it will then be held for YOU. Usually you sign up to get an email or a text letting you know that the book is ready for you, and most libraries give you a certain amount of time—mine is four days—to come in and pick it up. Sometimes, with a really popular book, there might be a few people who’ve placed holds before you, so the wait is a little longer. But still, by placing the hold, you’re saving your spot as next in line. If your library’s branch DOESN’T own a copy of a book you want, they’ll usually borrow it from one of the other branches near them and then loan it to you. But if the whole library system doesn’t own a copy of the book you want, you can request they purchase it! Libraries WANT to know what books their readers want to read. So again, this is something you can do on most library systems’ websites. But if not, go in and talk to a librarian. Ask them how to “REQUEST A PURCHASE.” They’ll know what you mean. I couldn’t believe it the first time someone told me I could do this. I can just say, “I want you to buy this book,” and they’ll be like, “Okay,” and then they’ll actually BUY it for me!! And then I’m the first person who gets to check it out in the whole library system!!! Also remember that sometimes you can find books you want in other formats. If you have access to a tablet, computer, or e-reader, you can access books in digital format. There are also audiobooks (though with MY books you’d miss out on the drawings, which I happen to think are half the fun!!! 🙂 ) and large-print format books. Finally, everything above applies to public library systems. School libraries all work differently. BUT the one thing that’s the same is that school librarians and public librarians ALL want to help kids read the books they’re excited about! So if you can’t find a book you want in your school library, talk to the librarian. If they say they don’t have it, ask them if there’s a way the library could get it. They might say no—school libraries often don’t have enough money for everything they’d like to do. But maybe you could brainstorm with the librarian on ways to raise money for the library. And when the library DOES get funds for new books, the librarian is going to remember the kid who came to and asked them about a book they were super excited about. I hope this helps you understand new ways you can use your public library system and read the books you most want to read! Libraries are full of so many cool things! In our comments section, please tell me the top three books you’d love to check out at your local library! Also, do you visit your local library regularly? I just got a library card! Our library has the whole series. WOW. That IS a bookworm’s nightmare. I understand. I’m a bookworm, and my mom says I read TOO much. Only ten books?? I could read that in 2 months!! This is why I ALWAYS ask for new books!! I read them so fast!! I would hate it if my parents didn’t let me buy Dork Diary books! I have some options/ tips that could help! The book your looking for may not be on the shelves but they might have it in. The librarians can always have a look for you and check their stock. When I mean other library I don’t mean, go to another library and check. I mean you can always ask your library to see if another library has that book, if not then they can order it in for you and you can go back another day to see if it is in, then you can read it and once your finished, return and repeat! Your parents may not have the money but doesn’t mean you can’t earn some. You can go and deliver newspaper around or leaflet dropping, any part time job would help you earn enough money to buy that new book you want! If not then save your money up, have any lose change put it in a pot or piggy bank or any money you find around. It all will help! Your friends can always by the book you want and then you can repay them once you have the money! Or maybe your friends have the book you want, I’m sure your friends have some books that you want to read and then you can always borrow them. Your friends are like libraries! Lol. Who else is looking forward to the new Dork Diaries book?! I know I am! I’m so excited for Dork Diaries 13! I wish it was out already, we’ve all been waiting so long! Okay, i’ve been trying to reply to you for ages but for some reason IT’S NOT POSTING!!!! I mean, sorry *ahem ahem*, it won’t post. Anyway, i wanted to reply to you because you are going to the HP Studio Tour in the summer too. No way! This is so amazing! 2. You are going on the tour! Sorry just got a bit carried away. Oh and also YES i cannot wait until the new book comes out! Why can’t it come out sooner?! you can also barrow one from your family but dont tell them to buy it . only if they already have it then you can give it back!! I sometimes get used books! They are SO MUCH CHEAPER!! I totally get it! My mom says whenever I buy a book, it just sits around somewhere. Which is SO not true. (But I can buy them sometimes). Anyway, Tales From A Not-So-Happy-Birthday doesn’t release until October, like Nikki said. So that’s probably why you can’t find it yet. And if your library doesn’t have the book, the other libraries will loan the book to you. This is kinda like in, “HOW DO I PICK A FAVORITE BOOK”, but if none of the libraries have Tales From A Not-So-Happy-Birthday, then ask the library to purchase it for you. In my library, they don’t always have the book version of the book I’m looking for. They might have an eBook, though. If the eBook isn’t available, you can put yourself on hold,. Most of the time your library will notify you saying your book is available for you to read. They give you a time limit, and if you don’t pick your book up before it’s gone for another person, then….well, it’s gone. In my opinion, I think that public libraries have more books and stuff that school libraries, so just ask your mom and dad if you can order books there. Sometimes there are contests even, like if you read this amount of pages first you win a prize! (Book, backpack). They might have Dork Diaries 13! Also, you said your MOM and Dad don’t like to spend your money, so maybe you can spend your own! Books don’t cost much usually, and you could do extra chores or babysit for extra money! This is all my library experience, but I decided to share it with you! Sorry- I meant to capitalize “dad” too! And sorry if this is too long, but I wanted to help! Great advice!! I’m sure Bookish & Broke will appreciate this!! Awesome advice Dorky Diamond Diva! Scotch Eggs is right, Bookish & Broke will appreciate this! WHATTTTTT?! AMERICAN LIBRARIES BUY BOOKS IN FOR YOU???? 2 books from The land of Stories and if they have Dork Diaries books I haven’t read or want to read again, I check that out too. I so can’t wait for the 13th book. It was very simple! But when we picked it up I was waaaaaaaay too impatient to wait so we’d already bought it! Traaaagic!! But it is really useful so I definately say that you should do that!! I NEED to read the Harry Potter series. I’ve watched the movies loads of times but I haven’t read the books. That is something I will try and do during the summer. Definately Miss Dork. It is a necessity of life!!! You can buy books from thrift shops! I do, and sometimes there are some super good books there! Definitely recommend it! So true!!!! There is this used book store close to my house, and They have A LOT of my fave books there!! Also, the more books you donate there, the cheaper the books you buy!! SOOOO AWESOME!!!!! I had trouble finding mine too something that I suggest is that if you have a kindle or nook you can go on a website called library2Go or overdrive! 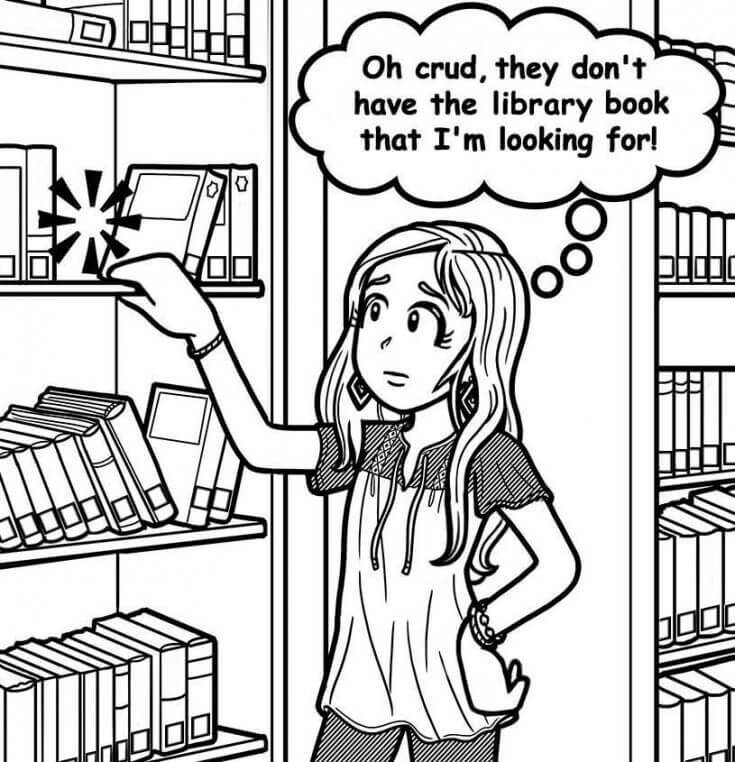 You can check out books online without haveing to have all the hassle of going to the library! I have 8 Dork Diaries books and I can’t wait for the 13 th one!!!!!!!!!!!!!!!!!!!!!!! I suggest, like Nerd of the School said, save money. It may be hard, but you’ll do it. If there’s a book they don’t have, suggest it to them or ask if it’s checked out at the moment or if they’re out of stock.Ask them to put it on hold for you (if you can). I get books all the time. Seriously I’m not kidding, my bookshelf’s full and now I don’t know what to do with the 8 other books I recently got. Any suggestions?!?!?! Bookshelf’s are expensive and I don’t think i’m going to get a new big one right away. Also, how long do you guys think Dork Diaries is going to go on? I’m guessing up to 15. Comment! 1. Ask the library if they can save that book for you. 3. wait till the right books are on a low price. All you haft to do is anything you just said amazing job! Hi! I actually only have 5 dork diaries books! My parents don’t like spending money on stuff that seems pointless. They really just judge a book by its cover (sometimes). I actually ask my friends if I can borrow their dork diaries books, since they have plenty. You could do that or see if you could save money to buy books and do chores to earn it, or ask for birthday money. That’s all I can recommend. Hope it helps! Hi nerd of the school, I usually ask Santa for any books I like and guess what? At Christmas I actually receive those books I wanted all year. So make a Christmas wish and Santa will get it for you. Dorky Guitar Player but she said her parents don’t like to spend money! Not everyone is privileged enough to just ask Santa for anything they want and magically get it.